If you've got a read-only database, you don't have to worry about transactions. But for almost every application you're ever going to build, that is not the case. Therefore, the concept and managing of transactions is central to the success of your application. You can find lots more details in the Transaction Processing and Control (doc) and in the links to Oracle Live SQL and Oracle Dev Gym resources below. 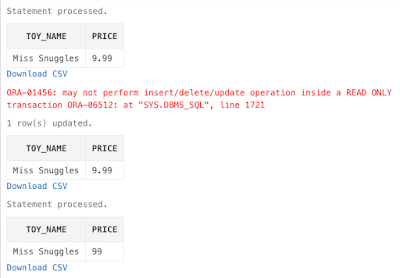 Recall the definition of a transaction: "A transaction is a sequence of one or more SQL statements that Oracle Database treats as a unit: either all of the statements are performed, or none of them are." When all of the statements are "performed", that means you committed them or saved them to the database. Use the COMMIT statement to save all changes, and make them visible to other users. Remember: no one can see the changes made in a particular session until they are committed. Once committed, every user with access to the affected tables now see the new "state" of the table. Use the ROLLBACK statement to reverse all changes since the last commit (or since you started the first transaction in your session). This LiveSQL tutorial (a part of the Databases for Developers course on the Oracle Dev Gym) demonstrates these basic elements of transaction management. But wait! What if you only want to reverse some of the changes in your session, but leave others in place, ready to commit at some point in the future? Welcome to the world of savepoints. Savepoints let you roll back part of a transaction instead of the whole transaction. The number of active savepoints for each session is unlimited. For the recursive programmers among us: If you mark a savepoint in a recursive subprogram, new instances of the SAVEPOINT statement run at each level in the recursive descent, but you can only roll back to the most recently marked savepoint. By default, when you execute a COMMIT statement, all unsaved changes in your session are saved. And when you roll back, all unsaved changes are erased. Sometimes, though, we'd like to save just one of our changes, but not the others. The most typical use case for this scenario is error logging. I want to write information out to my error log table and save it, but then I need to roll back the transaction (there is, after all, an error). It's possible I could use save points to do that (see previous section), but that is hard to get right consistently and dependably when you are calling a reusable logging program. Fortunately, I can simply make my error logging procedure an autonomous transaction. Then I can insert the error information and commit that insert, without affecting the business transaction, which will subsequently be rolled back. This LiveSQL script contains the full (and very basic) error logging package. 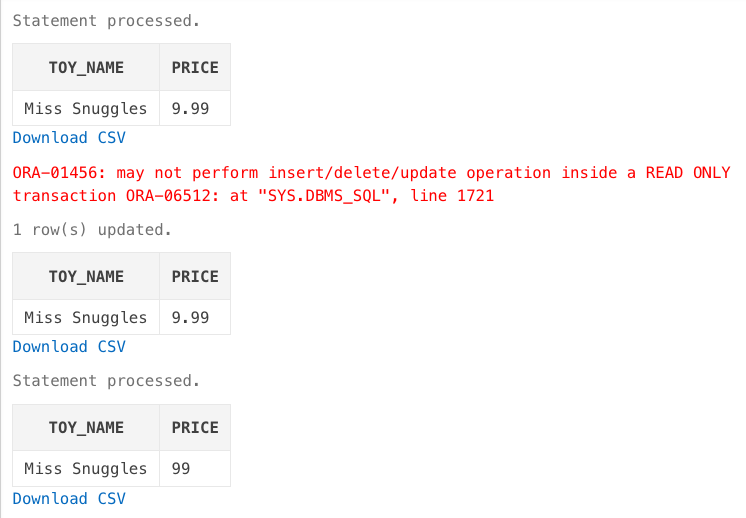 This LiveSQL script demonstrates the effect of an autonomous transaction pragma. Use the SET TRANSACTION statement to establish the current transaction as read-only or read/write, establish its isolation level, assign it to a specified rollback segment, or assign a name to the transaction. Oracle supports just two isolation levels: Read Committed and Serializable. This is the default mode for Oracle Database. Using read committed, you have statement-level consistency. This means that each DML command (select, insert, update, or delete) can see all the data saved before it begins. Any changes saved by other sessions after it starts are hidden. It does this using multiversion concurrency control (MVCC). When you update or delete a row, this stores the row's current state in undo. So other transactions can use this undo to view data as it existed in the past. You are, in other words, isolated. Consider using serializable when a transaction accesses the same rows many times, and you will have many people running the transaction at the same time. Chris Saxon covers all of these topics and more in his LiveSQL module. Be sure to check it out! A basic, but very important topic explained in easy to understand language, as usual. Excellent work. I'll keep this as future reference for new developers. Is this book still userful/valid for 11g and 12c.? I am not able find the PL/Vision package collection,all I am finding is broken links. Can an one share the link to PL/Vision package collection. ?